Students, alumni and staff are warmly invited to be part of a commemorative Centenary Pathway.The pathway is an opportunity to celebrate and honour those who have passed through our doors, and walked the historical pathway between the Eden and Newlands Road campuses. 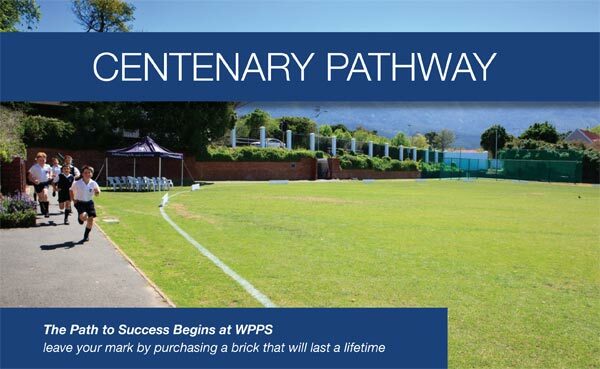 The engraved bricks will provide a tangible history of WPPS, and will serve to remind those who follow that they are part of a wonderful community of students, alumni, parents, grandparents, teachers and friends, who have nurtured and supported the school and its values since its founding in 1914. The names of those who walked the pathway before them will inspire future generations. The funds raised from the brick sponsorships will support the Centenary Fund. The Centenary Foundation Trust contributes to every aspect of the school’s future, and will be a lasting resource that makes a difference across generations. The pathway will officially be opened at the end of 2014 and will replace the current tarred path between the Eden and Newlands Road campuses. email: or fax: 021 762 6120. WPPS Centenary Foundation Trust has Section 18A status as a Public Benefit Organisation. This means that South African taxpayers may be eligible to enjoy a tax deduction for donations up to 10% of annual taxable income. Donors are issued with a Section 18A tax certificate.